Passion is great suffering. Compassion is great sympathy and desire to alleviate suffering. comPassion explores these fundamental human experiences through musical settings of deeply painful stories countered by heroic acts of love. Robert Kyr will introduce the repertoire and themes of the comPassion festival. To follow, composer John Muehleisen will give an outline of his Pietà, a brief explanation of each movement, and examples of how several of the movements express the themes of compassion, mercy, and love that are central to the oratorio’s message. The composer will also discuss Pietà’s relationship to the Passion Oratorios of Bach and how his work draws on musical material from both Bach’s St. Matthew and St. John Passions, honoring the Baroque tradition practiced by Bach, Handel, and others of borrowing musical material from other works, including their own. John will also explain how and why Pietà’s narrative spans three historical time frames: the Biblical times of Christ’s Passion and Resurrection, World War I, and our present time. Please join John for this rare opportunity to understand this major new work from the composer’s perspective, and greatly enhance your experience and understanding of this Passion oratorio for our time. Listeners are invited to join Craig Hella Johnson, John Muehleisen, and Pietà artists to informally share responses to Pietà and ask questions about the piece. We usually think of the passion as a story told by one of the four evangelists: Matthew, Mark, Luke or John. However, many other people witnessed the final days of Christ’s life and also told this story. Robert Kyr has been commissioned to create a new work for Conspirare—The Passion according to an Unknown Witness—which will reveal the experience of an individual whose written gospel was never found, yet has a surprising and powerful perspective to share. The workshop will explore the passion story as a journey (or “passion walk”) that the participants will take together, guided by both Robert Kyr and Craig Hella Johnson with members of the Symphonic Choir. Regardless of one’s faith background, the passion story is relevant to our lives as an example of the suffering that is a fundamental part of the human condition. The life of Jesus is filled with aspects of suffering that are common to all of us, and in that sense, his story is universal. For this session, Robert Kyr will give a presentation and lead a discussion about the text of the passion story and the ways in which it has inspired some of the greatest music throughout history. Interactive workshop performance of a Passion in progress by Conspirare’s Artistic Director Craig Hella Johnson, inspired by a young gay man’s senseless murder on a snow-blown night, and in response, excerpts from a beloved Requiem by a 20th-century master. With Austin Haller on organ and Requiem soloists Keely J. Rhodes, mezzo-soprano, and David Farwig, baritone. With special guest slam poet Lacey Roop. Presented with a brief intermission between works. –Advance sales end 6/8, 4pm; Will Call / Door sales begins 6:30pm. Lacey Roop placed 6th at Women of the World Poetry Slam 2011 and has been ranked number one female poet in Austin for the past 3 years, representing the city twice at Individual World Poetry Slam (IWPS) and a two-time member of Austin Poetry Slam. Lacey has published three chapbooks, and her full-length book And Then Came the Flood is the highest seller at Timber Mouse publishing. Lacey’s work explores topics ranging from gender to magical realism. Enjoy a special comPassion Prix Fixe Dinner at Gusto! The Texas premiere of new music on ancient texts, by cutting-edge composers who happen to be identical twins. Presented in a workshop reading of a newly realized 4-hand piano version. Pianists Sheryl Stack and Brooks Whitmore. 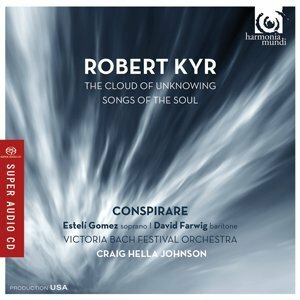 A party celebrating Conspirare’s Harmonia Mundi CD release of works by Robert Kyr will immediately follow the performance of A Gnostic Passion and will take place just outside on the plaza. 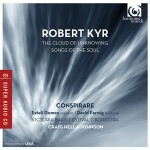 Composer Robert Kyr will attend and be available to sign CDs. Complimentary Amy’s ice cream (with toppings, too)! Bach’s great sacred oratorio recounts the persecution and suffering of Jesus, with tenor Dann Coakwell in his signature role as The Evangelist and baritone Paul Max Tipton as Jesus. More than 35 Company of Voices singers will be joined by the Conspirare Youth Choirs (CYC) Chamber Ensemble (Nina Revering, Director) and members of the Victoria Bach Festival Orchestra on period instruments in this not-to-be-missed Conspirare season finale. Austin concerts SOLD OUT except for a small number of obstructed-view general admission seats now available for $18. Not available online; buy at 512-474-5664 or the Long Center box office. St. Matthew Passion final Chorus, “Wir setzen uns mit Tränen nieder” (“We sit down in tears”) from archival recording of Conspirare Symphonic Choir and Orchestra (on modern instruments), conducted by Craig Hella Johnson, April 2000, St. Martin’s Lutheran Church, Austin. J. S Bach’s St. Matthew Passion is not only about the suffering of Christ, but it is a profound musical journey that explores the theme of compassion. In what ways does Bach’s masterwork enlighten us about our own suffering and its relationship to the suffering of others? How does this monumental work awaken a sense of compassion within us? In this post-concert talk, Robert Kyr discusses Bach’s unforgettable work as a life-transforming experience, a musical embodiment of compassion.